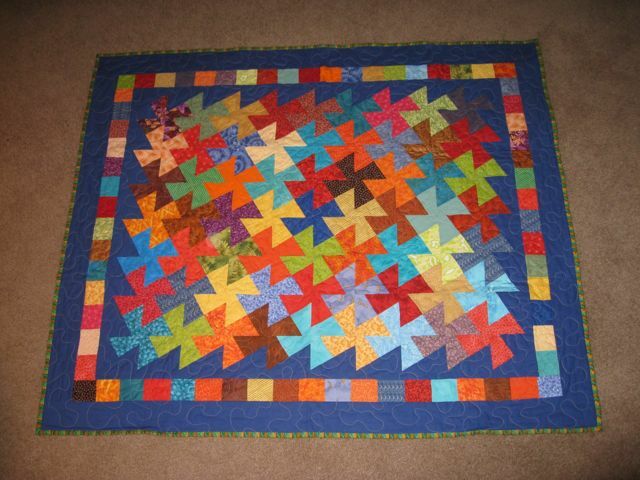 This is my first attempt at the Square Dance pattern, also called Twister or Trust Me. I made my own template so I could use some pre-cut 6″ charms from a swap a few years ago and not have any waste between the secondary cuts. As you can see, I used the left over squares in the border. This one goes to new baby boy, Roy Peter, born on Thanksgiving 2010. He weighed in at 10 pounds 3 ounces. Wow! Quilted with a grey thread and large meander all over.